Red Knight Entertainment has started up their Corpse Hammer Kickstarter. They've also got a new preview up. This is for the House Remegoth Carrion Callers. The Corpse Hammer Kickstarter is live! Please support if you may! 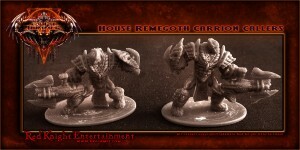 For preview we have the House Remegoth Carrion Callers. The Carrion Callers are a heavy weapon unit armed with the Carrion Caller Quad Barrel Cannon. Aside from providing a continuous barrage of heavy mid-range firepower the Carrion Caller also has two blades attached at the front allowing the wielder close combat attacks. Anyone within striking distance may be lunged upon and gored by the heavy weapon. Removing one's enemy from the blades requires a simple pull of the trigger. The cannon may also be swung up or down using the blades in the sense of a makeshift axe. In a more defensive role the Carrion Callers also carry the Blood Buckler shield, a smaller version of the Blood Bulwark Shield carried by the Death Eaters. Red Knight Entertainment continues their Corpse Hammer previews with the Necrovanum Berserkers. For preview we have the Necrovanum Berserkers. The Necrovanum Berserkers have both a ranged Venom Cannon as well as a heavy Necro Syckle for close combat. The Necro Syckle is unusually large for the Berserkers and is difficult to wield under their own power resulting in clumsy or ill planned strikes against the Nephalim Knights. However once per game the Berserkers may engage a Necro Charge through the tubes in their back which floods their body with a heavy amount of powerful toxic fluids embodying them with crushing brute strength and speed. This effect lasts two turns, afterwards leaving them in a more weakened state. Will be available in the Corpse Hammer Kickstart first week October. 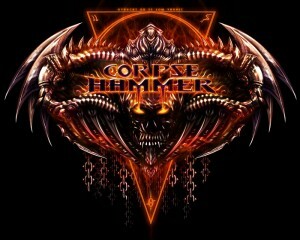 Corpse Hammer puts up another preview. This one is for their House Ramegoth Death Eaters. For preview we have the House Remegoth Death Eaters. The Death Eaters wield the heavy Crucigoth Butcher Blade as well as the Blade Bulwark Shield. The Crucigoth Butcher Blade is House Remegoth's own unique melee weapon. It is used in powerful strokes to render the Death Eater's enemies asunder. The sword may be turned sideways and used to block incoming ranged attacks from the Necrovanum. Yet to add to the Death Eater's defensive capabilities is the Blade Bulwark. A thick shield capable of blocking almost any attack, the bulwark has a blade running along its circumference allowing the shield to be swung sideways and used as an additional hand weapon. The Blade Bulwark may also be hurled into enemies, thoroughly engorging the Death Eater's unfortunate enemies. Usually units are named after their weapons. However since each house has its own unique melee weapon, these melee specific units are given a singular name across all houses. Hence, Death Eaters. House Remegoth Death Eaters are 4 models per unit. Will be available in the Corpse Hammer Kickstart in early October. Red Knight Entertainment gives us our second look at Corpse Hammer with their Necrovanum Hate Faces. Up for preview we have the Necrovanum Hate Faces. Born of dark arcane machine with flesh and cybernetics, the legions of Necrovanum are then raised from their dead state by the Arch Necromassers. Red Knight Entertainment is going to be coming out with a new minis game: Corpse Hammer. They've got the first of the previews up. Announcing an exciting new 32mm game from Red Knight Entertainment. Corpse Hammer is a Dark Science Fiction/Fantasy miniature game set in a world laden with arcane energies. On one side you have the supernaturally gifted Nephalim Knights defending the immortal populace from the cybernetic hordes of unliving known as the Necrovanum. Today for preview we have the first unit of 5 that will be shown in the next couple weeks. Red Knight Entertainment has previews of the next of their Sci-Fi terrain sets on their website. They'll be ready for ordering soon. We have the last preview for the upcoming Materion Future Tech Terrain. We have pictures of the last 4 buildings that come with the Future Tech set as well as the double wide scenario building. There is now a detail shot of all 13 buildings on the website. Red Knight Entertainment has some new Sci-Fi terrain available. Stop playing with soda cans and lemon peels for terrain! We are proud to announce the 1st preview of the Materion science fiction city terrain. A huge set with 13 different buildings, plenty of 4 and 6 lane street tiles and a large variety of city props. 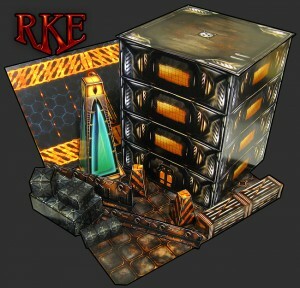 Go to www.rkegames.com for previews. 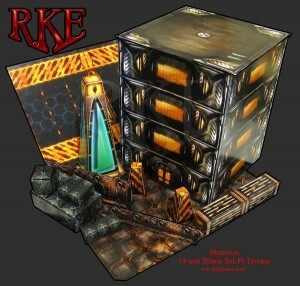 The RKE Materion Sci-Fi Terrain set will be available in roughly two weeks in PDF form for the introductory price of $14. After the first 400 sales the Materion Sci-Fi terrain will be permanently restocked at $20. Get it while it's hawt!